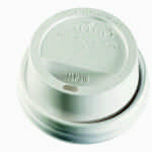 Dome shape is ideal for use with foam drinks. White plastic. 1,000 lids per case. Tear back opening feature. White plastic. 1,000 lids per case. Travelers Lid. White. 1,000 pieces per case. Provides snug fit. Choice of four bubbles to identify contents. Straw slot. With straw slot. 1,000 lids per case. Clear with straw hole. 100 lids per pack; 10 packs per case (1,000 lids). Translucent polystyrene with straw slot.